We are in the last phase of this trip. That makes it both sad and exhilarating. Sad that another glorious trek is coming to an end, but at the same time we are heading through an area that I call home, we will be seeing my family (and that is something I have not done enough of), so we will be going through some countryside that I have not seen in a long, long time and then some that I do not remember at all. Here we go off on another Hobbit’s holiday and it is on our way home. Well sort of on our way home. And since “sort of” is about as well as we ever do, it will have to do for now. We have our marching orders and we wrote them. 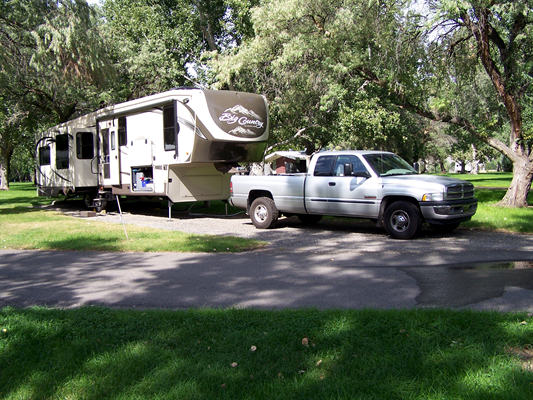 Our first stop, Beach Loop RV where we have stayed before. 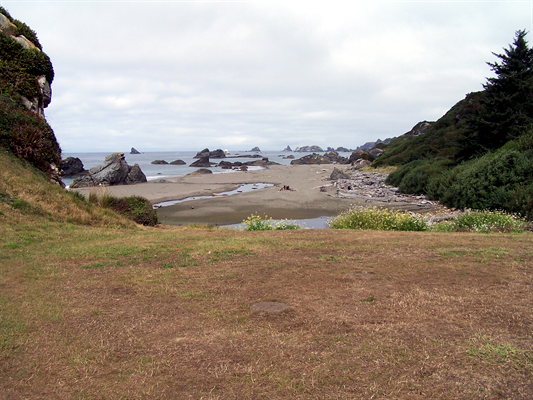 It is a nice open campground just south of Bandon. We did a little beach walking and resting and just enjoyed the sunshine. 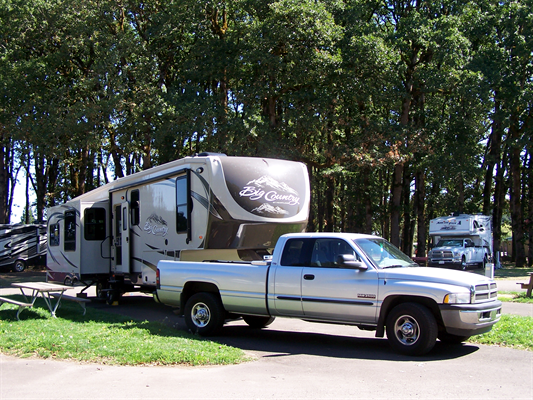 From Bandon we went on to Oceanside RV in Gold Beach a nice little park between the airport and the beach. We rode the “Mail Boat” (see previous post), walked a few beaches, and, I got a much-needed haircut while Elaine shopped for knitting supplies. We also took a day trip on down to Brookings where we stopped at Harris Beach State Park (beautiful) and shopped the town. I met Dave Jenkins, a multi-talented craftsman, there and we spent a fun hour or so discussing woodworking in general and computer numeric control in particular. 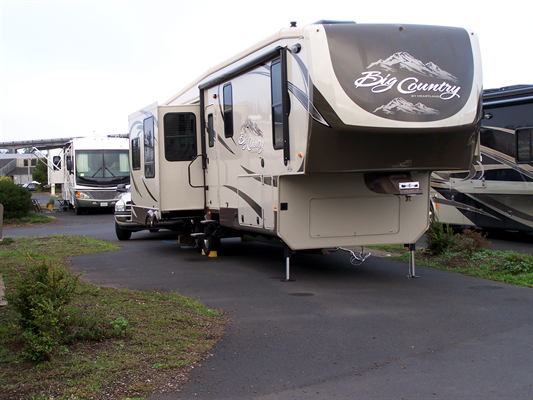 From Bandon we headed 180 miles north to Newport where we stayed at the Port of Newport RV Park which is a very large parking lot style park. Driving back up the coast was sort of like watching an old newsreel at the movies. My inner voice was not quite in sync with all the scenery we passed. It was like watching the whole summer go by in a few hours. 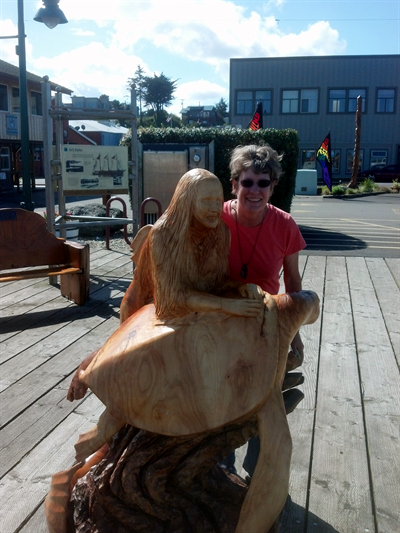 We did stop at a farmers market in Port Orford where I met another woodworker and also a mushroom hunter. I purchased some hedgehog mushrooms simply because I could not remember having ever eaten them. When I later sautéed them with butter and thyme they were very good. While at Newport we strolled the Nye shopping district, went to the Yaquina Bay and Yaquina Head lighthouses, walked agate beach, and took a nostalgic (I did a lot of fishing and clamming in the bay when I was a boy) drive up the bay to Toledo. 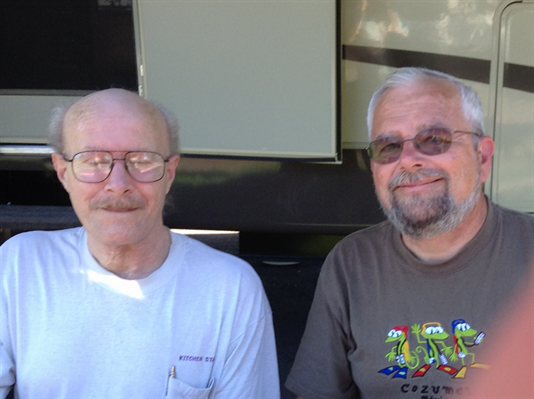 From Newport we went to Corvallis where we stayed at the Benton Oaks RV Park. We were able to meet up with my older brother, 2 of my step brothers and my step sister. We enjoyed the visits and It was nice to see “the old stomping grounds” but the town has gotten almost unrecognizably big. I am not sure I like it that well anymore. Maybe I have just lived too many other places. 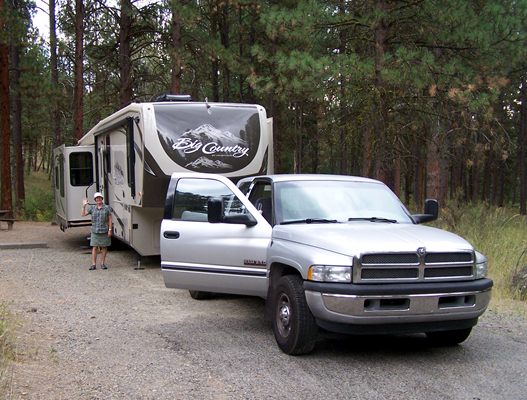 After the short stop in Corvallis we headed over the South Santiam Pass through Sweet Home and Sisters to the Redmond Expo RV Park for look around in an area we have never been to. We found a very pretty town that is well on its way to becoming a prime retirement community. The park was nice and our only complaint was that they were holding a monster truck competition and even though we were at least 1/2 a mile away those trucks were loud. After that when we were sound asleep, around 3 AM, there was a train. Oh well. Enough of the cities we went back to the woods and stayed a couple of days at the Union Creek Forest Service Campground near Baker City, OR. It is a beautiful and quiet place in a tall pine forest. 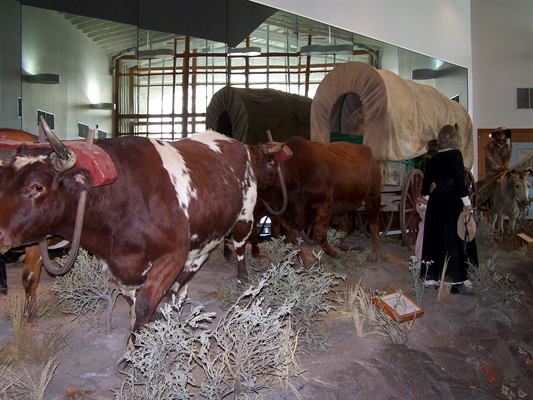 One of our little tourist pamphlets pointed us to the BLM Oregon Trail Interpretive Center and we were very happy to have taken the time to see it. Wonderful dioramas, movies, artifacts, and descriptive signage. We learned a great deal about the times, politics, travails, and equipment. 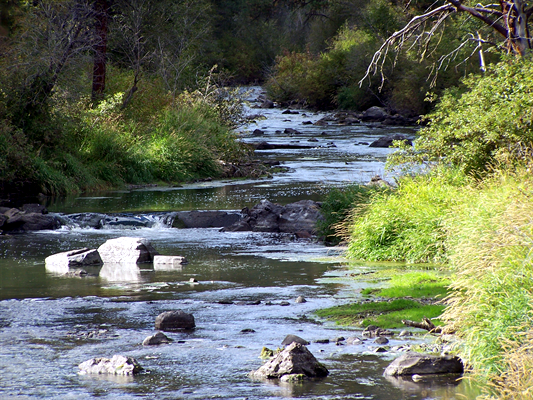 We toured around some and walked through historic downtown Baker City, Oregon and drove along the Powder River a small, splendid stream. While there we went to our biggest surprise of the trip, a huge 450 foot tall sand dune in the middle of southern Idaho. 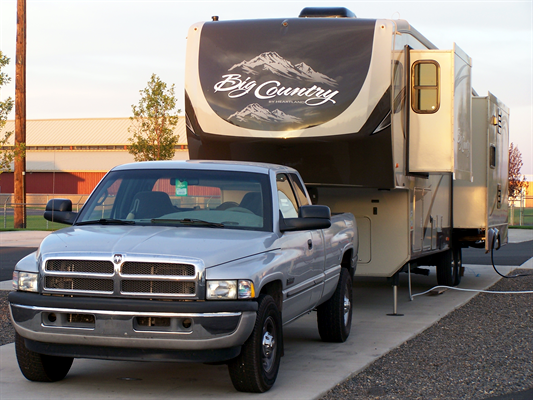 From Idaho we will travel down through Utah, the Las Vegas corner of Nevada, a little along the eastern edge of California and then across Arizona. We have a few more miles to go and I am sure a few more adventures though most of the rest of this trip will be through familiar country. I will write a post covering the rest of the trip and maybe a few things I forgot to mention along the way when we get back to the homestead. Twenty-five or thirty years ago Elaine and I took a ride up the Rogue River on a mail boat and thoroughly enjoyed it so on this trip we decided to do it again and we were not disappointed. We could have chosen one of the longer trips and though one of those might be more suitable for some folks we again chose the 64 mile mail boat run. Yes, it really is a mail boat. 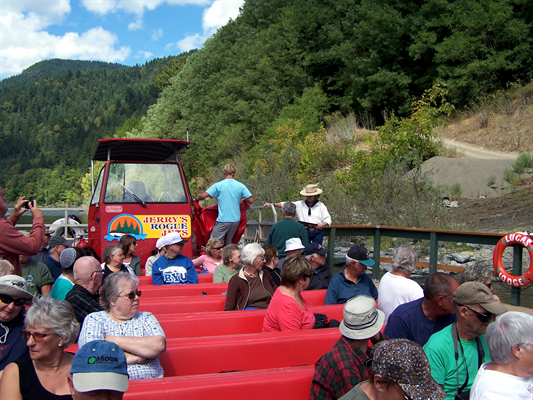 The mail is taken from Gold Beach to Agness and also picked up at Agness and taken to Gold Beach while we tourists gawk at the birds and other creatures and of course the scenery of the Rogue River. Here we are! Front row left with blue and red caps in the picture. (Or on the starboard bow for you purists.) Do you see the mail bag that is headed for Agness at our river pilots feet? 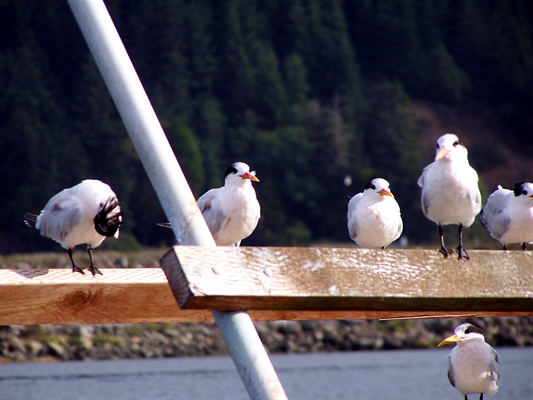 These elegant terns, very temporary migrant guests on their way south, greeted us on the way out. After turning out of the harbor we soon passed the highway 101 bridge. 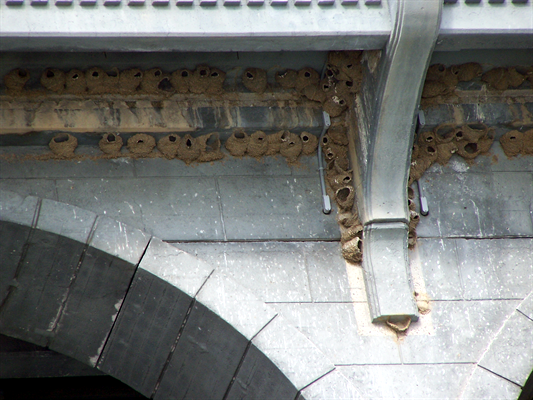 Where, on the underside, the swallows had built hundreds of nests. In addition to many birds we saw osprey nests at the very tops of trees and eagle nests near the tops, fishermen catching sturgeon, salmon, and steelhead, swimmers floating downriver on tubes, and boaters rowing their drift-boats. The weather was absolutely perfect with blue sky, sunshine, and temperatures in the mid 70’s. Wow, what a beautiful day to cruise the river. We ate a fine lunch at Cougar Lane Lodge and walked along the river admiring the large myrtle trees and the lodges well-kept landscape. 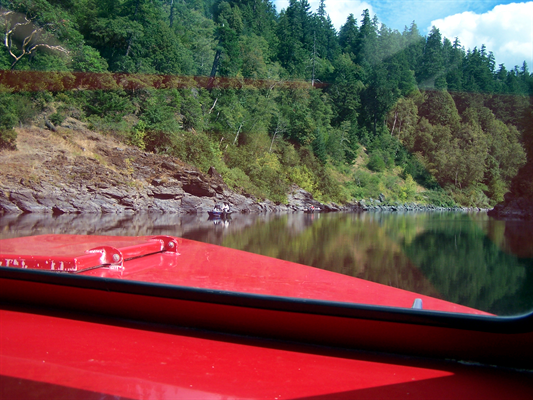 The views from the boat were awesome! On the way back to Gold Beach we pick up the outbound mail. 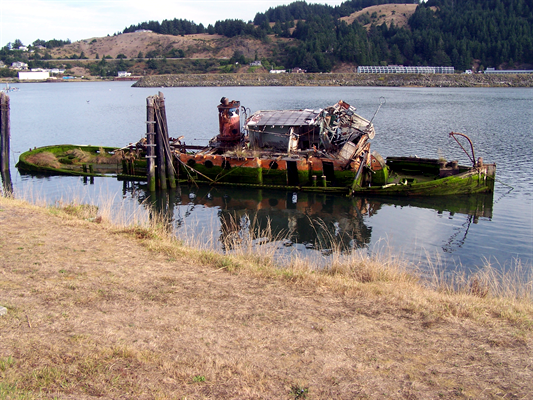 The ride was worth the money and the time it took to get to Gold Beach. Hopefully I will get a chance to do it again. Overall it was about six hours of fun. 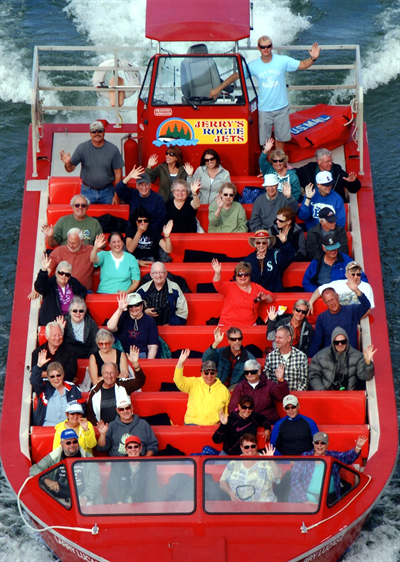 Oh, I forgot to mention that it is also a thrill ride with splashing water and 360 degree turns that are quite impressive as they are delivered by 1800 horsepower! That is 3 big engines driving jet pumps to get your adrenalin going.